Georgiana Ann Randolph Craig aka Craig Rice wrote 14 novels and was once so popular she made the cover of Time magazine. But she seems to have faded into obscurity over the years except to those of us who appreciate wacky mysteries from days gone by. This is my second Craig Rice book after HOME SWEET HOMICIDE which was a delight. Though I loved THE CORPSE STEPS OUT just a little less, it was still tons of fun - the setting, story and characters are totally different in tone and plot than HOME SWEET HOMICIDE. This is the second book in the breezy John J. Malone, shady Chicago lawyer, series (though the cover says otherwise). Malone's crime fighting (more or less) cohorts are Jake Justus, press agent, and Jake's girl friend (soon to be wife if they can find a moment in the middle of a frenetic case) Helene Brand. She is a high society dame who drinks like a fish (they all seemed to do that back then - didn't they?) and thinks nothing of jumping right into the middle of a baffling murder mystery. How these people can drink all night and yet still manage to put two and two together to catch a killer is beyond me, but they do. Jake Justus is currently press agenting the very glamorous Nelle Brown, a popular radio singer with her own show. It is the 40's, radio is still king and sponsors insist that entertainers adhere to the strictest morality, especially married entertainers - something Nelle Brown is apparently unable to do. Madcap Nelle indulges a very tangled personal life which it is Jake's job to untangle and keep under control. Though she is married and loves her elderly husband, Nelle drifts from man to man kind of like in a pin ball game, always on the look-out for some mythical ideal. But people cover for her because she is well-liked and she is the headliner. Her husband, Henry Gibson Gifford aka Tootz, seems unaware of Nelle's proclivities and she wants to keep it that way - in some strange way they are devoted to each other. However, when blackmail and murder rear their ugly heads, Nelle turns to Jake once more to get her out of this latest scrape. You see, there are a bunch of letters (letters - isn't that always the way?) which need to be found immediately if not sooner. Jake will also have to handle the fall-out from an awkward murder: the corpse of Paul March - Nelle's latest lover - whose dead body she had earlier discovered on the kitchen floor of their little apartment/love-nest. Naturally, Nelle had thought it best to call her press agent and not the cops. Unfortunately (or fortunately, depending on your point of view) when Jake turns up at the apartment later, the dead body has disappeared and the kitchen has been wiped clean of all murder traces. Where oh where has the corpse gone? "Why shoot a man, leave the body kicking around for an indeterminate length of time, and then come back, move the body and wash the floor?" Down at the radio station, the show must go on. Until a second and then a third murder intervenes. But wait - who in the radio biz would kill a potential sponsor? Nobody there is THAT crazy. This is a frantic hour by hour mystery of the sort made into movies (in fact a couple of these books were) in which everyone runs around, downing drinks to calm their nerves while trying to figure out what the heck is happening and trying to keep the cops from arresting someone they all like. Yeah, it's all a wacky hoot, but also a good whodunit (though an experienced mystery fiction reader might figure out who the killer is by mid-book) and fun to read. The setting is the city of Chicago - mostly at night, the best time for chicanery. The characters are the sorts of people you would expect to find inhabiting this world of zany fast-talking, morals all askew, radio folk. The action is frenetic as our heroes chase about in those great clunky cars of the time. My favorite scene: a madcap middle of the night escape from a building on fire as the cops give chase - Helene driving for all she's worth, scaring the hell out of Jake. Ah, good times. In the end, everything works out for the best that can be expected. The denouement is convoluted and hard to swallow, but what the heck, logic is not why we read these mysteries. Right? 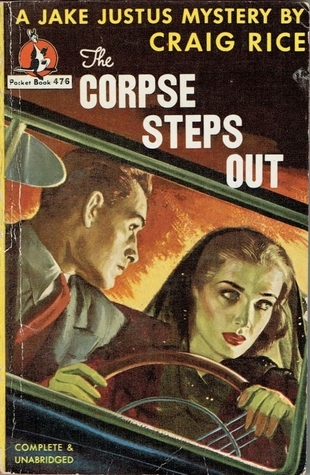 I managed to get a copy of THE CORPSE STEPS OUT in a nice cache of Craig Rice books I found on eBay for four bucks. I even got the same fabulous cover shown above. That's what I call luck. Okay, it's Friday, once again so don't forget to check in with Todd at his blog, Sweet Freedom to see what other forgotten or overlooked books other bloggers are talking about this week. Our regular host, author Patricia Abbott, is having a medical procedure. Here's to a speedy recovery, Patti! 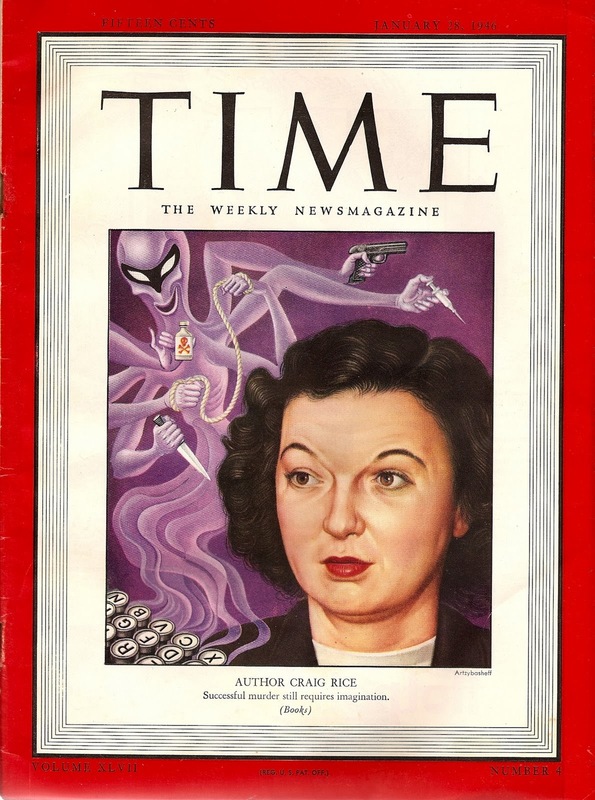 Craig Rice on the cover of Time. I've resisted eBay for years but I've heard there are bargains to be found. This was my first and so far, my only. :) Yes, these are fun books - nothing memorable, but not a bad way to spend a few hours relaxing. I tried a Craig Rice mystery a few years ago, don't remember which one or much about it, and my reaction was decidedly cool. I decided I'd give the author a skip in future, and have. Maybe it's unfair to only give an author one try, but there are so many others to read! If you don't like an author's work, then move on - that's my motto. :) As you say, there are so many others to read. I've liked the Rice books I've read (just a couple so far) so I'll probably read another one or two. Glad you are enjoying the Rice novels. I've reviewed quite a few on the blog and they're always good fun and the amount of alcohol consumed is impressive (and say the binge culture is a modern phenomena). Oh jeez, the alcohol. HA! I get woozy just reading about it. But this was fairly common back then - at least in books. :) I'm going to look up your reviews, Kate. Almost sounds autobiographical--so far as the swilling and man-hopping goes. Rice died of complications from alcoholism, as I recall. Well, now you have me hooked AGAIN, Yvette! I'm already working on Rock and Roll, the last of the Wentworth's Frank Garrett series, for next Friday. I just might have to read Home Sweet Homicide next. I'm starting to feel like an addict! I'm addicted to all these fun vintage books myself, Mathew. It's a great way to relax and wile away the hours. I just downloaded yet another Wentworth book - can't seem to stop myself. This novel sounds like grand fun! Love your comment about the heroine drinking like a fish. I'm always amazed at the amount of casual drinking in movies like THE THIN MAN, too. And let's not forget, the smoking. Jeez, it's a wonder that generation survived long enough to give birth to us. Ha. I only have 8 FACES AT 3 and TRIAL BY JURY, both Jake Justus novels, so I will start with that first one and look around for a copy of THE CORPSE STEPS OUT. I must have resisted them before because of the humor but my tastes are changing in that area. If your eBay cache happens to include Having Wonderful Crime, also featuring John J. Malone and the Justuses (who were married by 1943), you ought to be aware that RKO made that one into a movie, in 1944. Pat O'Brien played "Michael J. Malone" (that's Hollywood! ), Jake Justus was George Murphy, and Helene Justus was Carole Landis; RKO's clear intent was launching a Malone/Justus series, but no go. I've momentarily misplaced the Craig Rice novel (it's here somewhere, I know it! ), but the RKO movie is available on a Warner Archive DVD, so I watched it last night. My references indicate that the screenplay is "loosely based" on the novel (free translation: they kept the title and changed everything else), so the question here would be: how are O'Brien, Murphy, and Landis in the leads (and could they have pulled off a series)? My humble view is that they could have; Carole Landis was very enticing indeed as Helene, and Pat O'Brien made a sufficiently smart-alecky Malone. The Wonderful Crime movie itself is played mainly for laughs; the drinking side of things is downplayed just a bit. The supporting cast is mainly from the second tier; the exception is George Zucco, whose appearance here is sort of a throwaway (in several senses of that word). Malone (reclaiming the name John) was filmed at least twice more, without the Justuses; one of them is included in the above-mentioned DVD. This is Mrs. O'Malley And Mr. Malone, from MGM in 1950, with James Whitmore as John J. and Marjorie Main as a disguised Hildegarde Withers, here turned into a Ma Kettle clone for no real reason (as above, this was supposed to launch a series, but no go again). The other Malone movie was The Lucky Stiff, from Paramount in '49, with Brian Donlevy as Malone, and no Justuses; not available on legit DVD as far as I know.